With three golds won, the Dominican Republic dominated today the first day of the Central American and Caribbean Games in Barranquilla, in which Venezuela was awarded two gold medals and Colombia one. On the tatami of the Merymount School, the individual tests of katas (series of movement) and four categories, two masculine and two feminine, of kumite (combat) were disputed. The first gold that fell was that of the individual female kata, in which the Dominican Maria Dimitrova defeated the Venezuelan Andrea Armada in the final with a 5-0. The bronzes went to the Mexican Cinthia de la Rue and the Cuban Claudia Burgos, who lost in the semifinals with the Dominican and Venezuelan, respectively. Then it was the turn for double world champion Antonio Díaz, who won his sixth Central American and Caribbean Games title by defeating Mexican Waldo Ramírez in the last round with an impregnable 5-0. The Costa Rican Roy Gatjens and the Dominican Nykolai Arango climbed to the third step of the podium. The first final that was played in the kumite was between the Dominican Ana Villanueva and the Mexican Alicia Hernandez who won the island with a tight 1-0 test of the category of 50 kilograms. The third place was shared by the Guatemalan Cheili González and the Colombian Paula Ruiz, who lost in the semifinals against the two finalists. In the 55 kg, Genesis Navarrete of Venezuela defeated Cuban Baurelys Torres in a very tight fight that defined the arbitration, while the bronzes went to Alanis Carrera of Panama and Ilce Díaz of Guatemala. 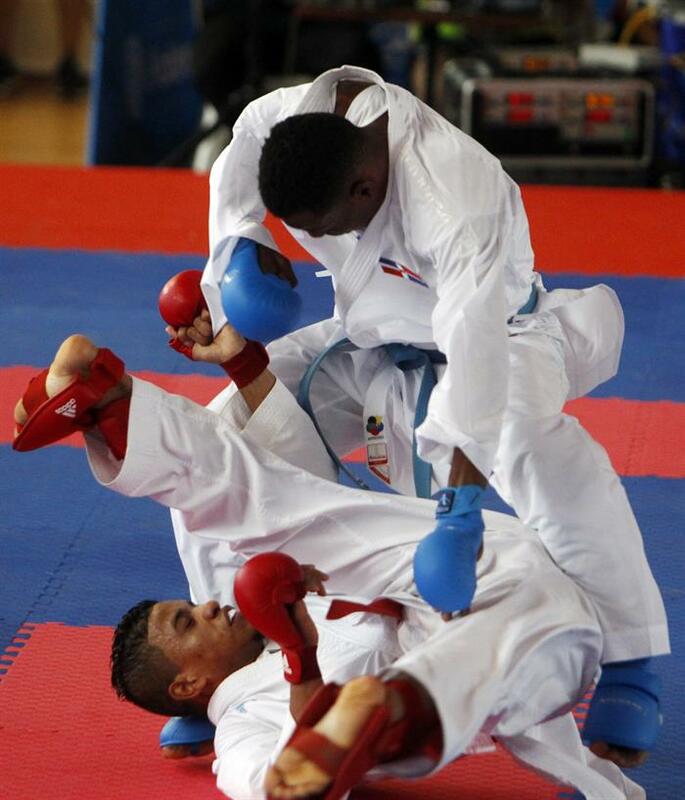 In the first decisive fight of the men, the Colombian Andrés Rendón gave the first gold to his country in the day after beating the Venezuelan Jovanni Martinez in an emotional fight that finished 7-4 in the 60 kilograms. The Nicaraguan José Rivas and the Costa Rican José Román also won medals in this category. The last gold was in the 67 kilograms for Deivis Ferreras, from the Dominican Republic, who defeated in the final fight the Cuban Maikel Noriega. The Colombian José Ramírez and the Panamanian Alberto Gálvez climbed the third step of the podium. The karate will continue this Thursday with the combats of the masculine categories of 84 kilograms and 75 kg, as well as the female of 68 kilos.